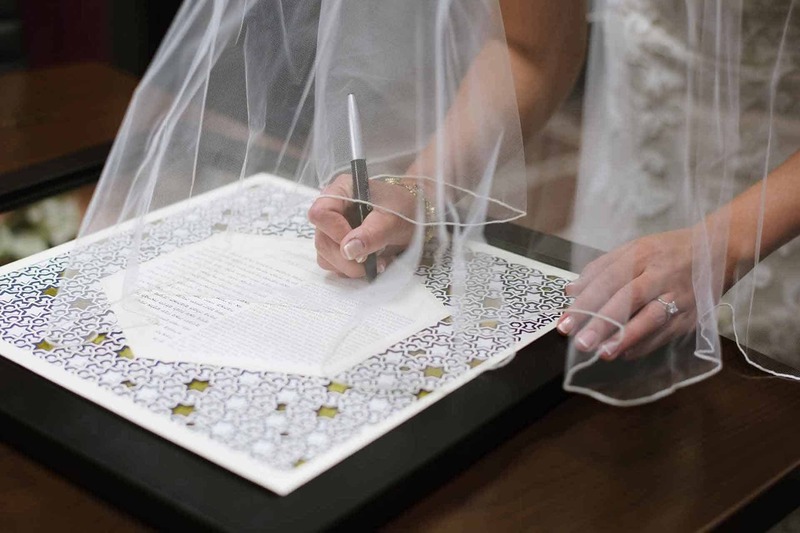 Custom ketubah orders are made to be very personal. 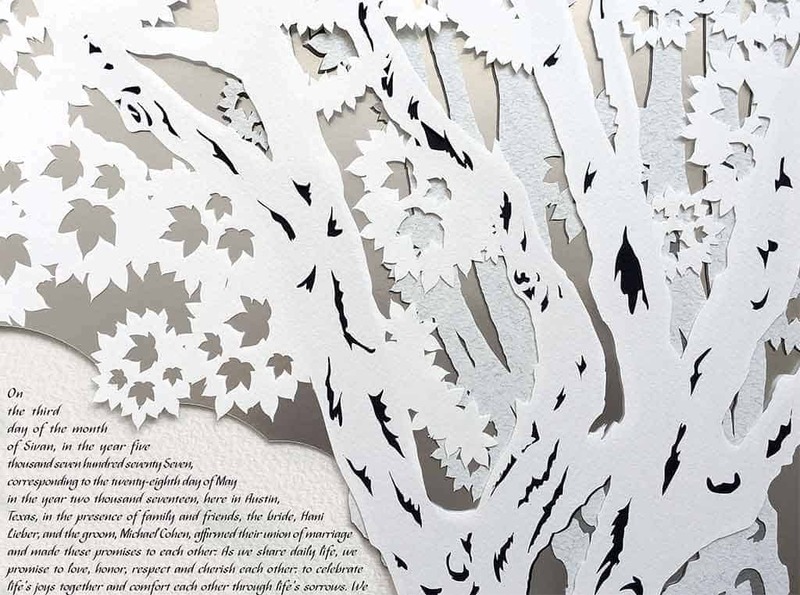 I was approached by a couple in California who really liked my tree with skyline design and asked if I had a San Francisco ketubah (I do). 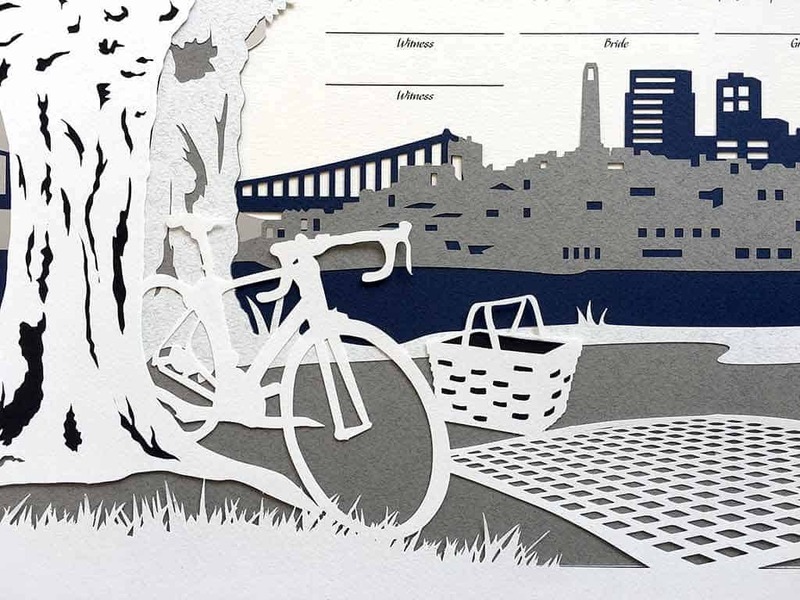 The skyline in the SF design wasn’t exactly the view they wanted, and the bikes weren’t the right models and the tree, in particular, wasn’t the right species. It’s a maple tree, but their street is lined with cypress trees. In the end they decided to take the same concept, but expand it into a much more personal version of itself. One of the basic elements that had to be included was their favorite picnic basket. This prompted a whole picnic tableau, including a blanket that connects the two sides of the design. The blanket in particular was very challenging. I wanted to show a checkerboard pattern, but since the familiar picnic blanket checks are stripes of color, representing them with a grid is very tricky — the squares end up looking small and the lines a bit chunky. I found that making the squares even smaller and more numerous solved the problem, but it was very difficult to get the perspective right (so that the blanket actually looks like it’s on the ground instead of looking like what it is — a flat layer of paper). 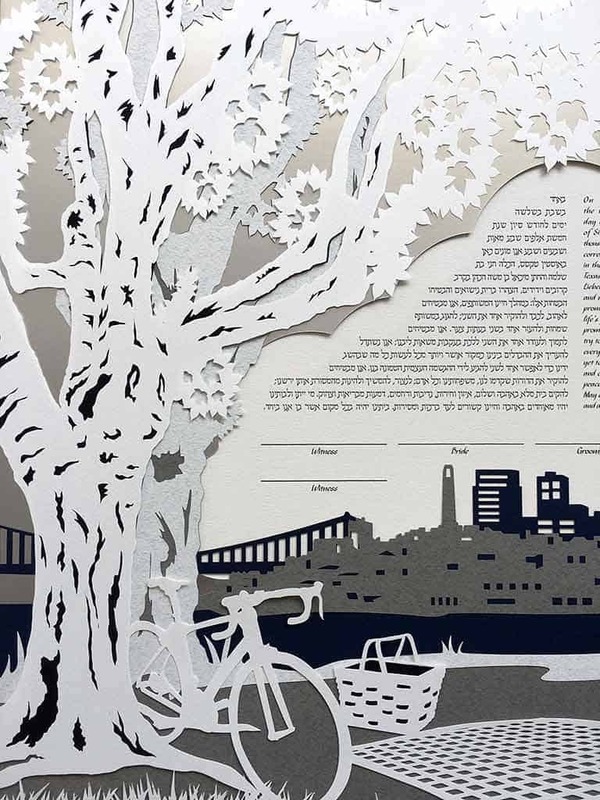 While the basic San Francisco ketubah design has the Coit Tower and Golden Gate bridge as the featured landmarks, it was important to expand it further and include the whole skyline all the way to the Transamerica building. 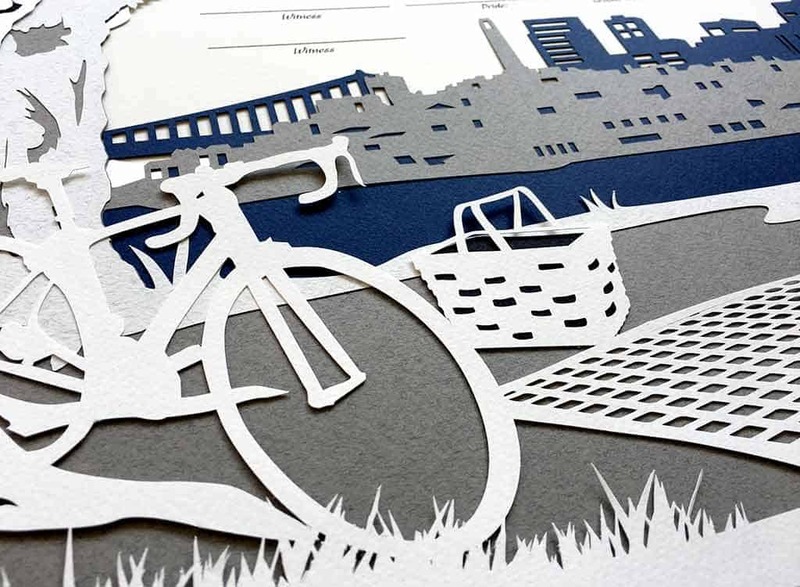 It takes a large degree of stylization to translate a real skyline into a flat papercut layer. This is because without the cues of depth or shading all dimensionality has to come from abstract shapes and how they interact with the layers below. Another challenge in depicting a real skyline is how to handle the windows. It is impossible to cut the windows out in real size so they have to be reinterpreted as well. If you were to actually look at the San Francisco skyline from a distance you would find that although this rendition is very stylized, you would be able to pick out each individual building in the real world. It is accurate as a 1:1 representation, even if it is counterintuitive to think so. This design was quite challenging from a technical standpoint. The trees, in particular, are some of the most complicated I’ve done. 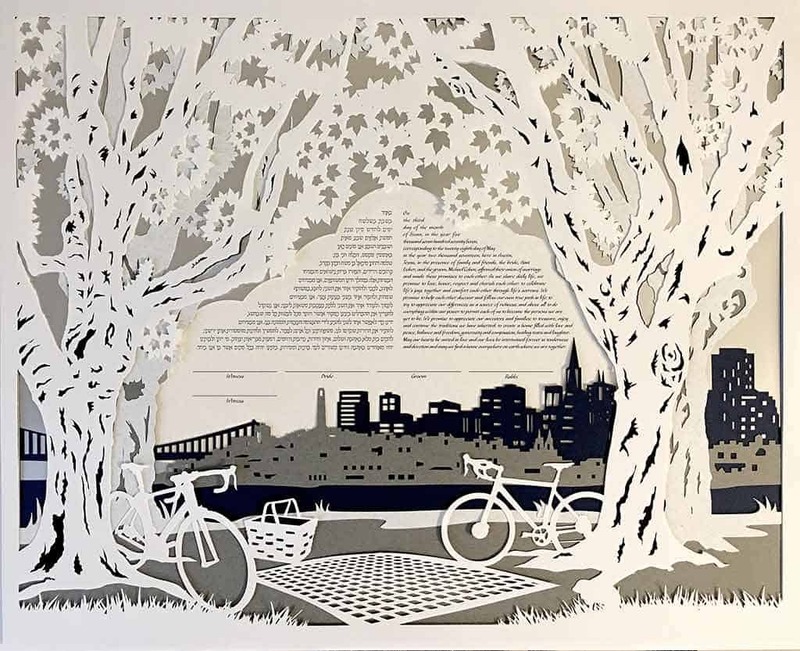 The way the layers stack up on each other is fun to design, but takes a couple of tries to actually pull off because of the flex in the paper once it is cut into ribbons. Because of the monochrome color scheme it’s difficult to tell just how complex the design actually is, but it is composed of eight layers. At 18×24 inches, that’s a very heavy stack of paper. I’m grateful when clients challenge me to push myself to do more and more complex work. 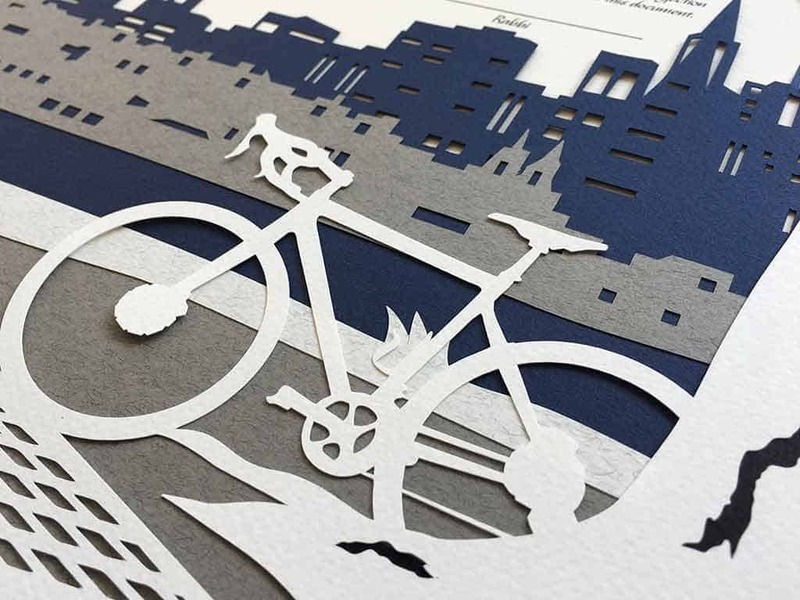 There’s a massive sense of satisfaction when a design like this is pulled off successfully. The other aspect of the design that was very important to get right was the cypress trees. I did a lot of research to learn what the special characteristics of these trees are. The way the bark grows, the way the branches fly out at extreme angles, and the way they grow thick foliage in a canopy. I had photos of the couple’s street to see what their trees look like, but the angle of the photos wasn’t always correct so I decided to go out and find some trees to photograph myself. It turns out that even though I live 12,000 kilometers away, we also have a related species here in Israel, that with some modifications could be adapted to look like the local species that grows in the streets of San Francisco. After finding the correct vantage points I ran a tree photoshoot and solved that piece of the puzzle. 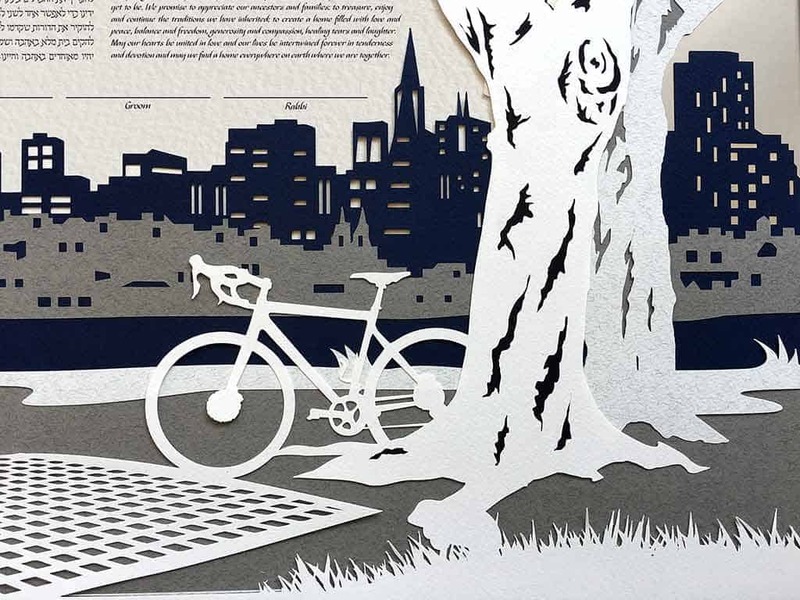 Knowing what the trees look like in real life also helped with the scale of the bicycles and how they would look next to the trees.